If you're in search of a casual yet sharp ensemble, try teaming a Maison Margiela v neck cardigan from farfetch.com with navy jeans. Both garments are totally comfortable and will look great together. 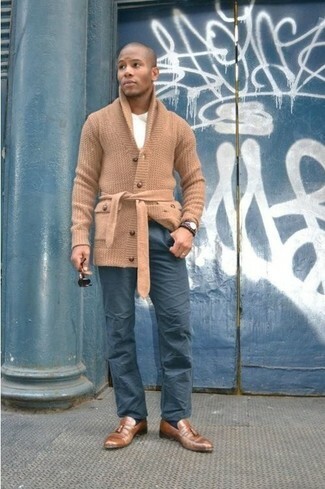 A Maison Margiela v neck cardigan and charcoal wool dress pants is a greatcombo for you to try. 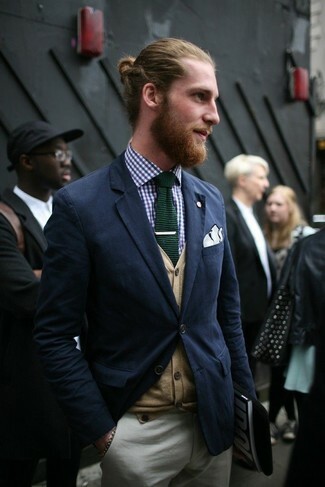 For something more on the daring side to finish off this ensemble, go for a pair of dark brown leather brogues. For a nothing less than incredibly stylish outfit, reach for a Maison Margiela v neck cardigan and grey plaid dress pants. 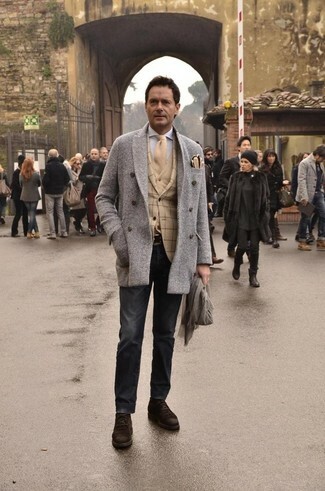 When it comes to shoes, this outfit is finished off wonderfully with brown suede derby shoes. 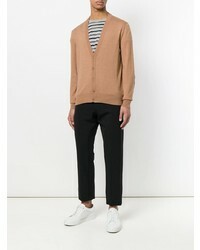 If you're after a casual yet dapper outfit, dress in a Maison Margiela v neck cardigan from farfetch.com and charcoal jeans. Both items are totally comfortable and will look great paired together. 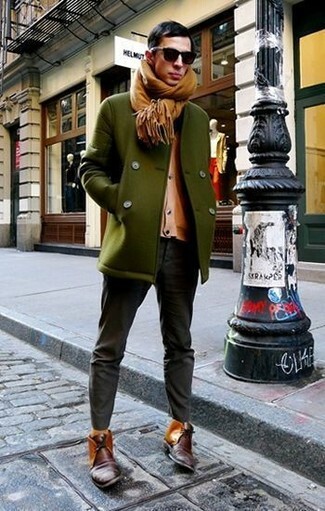 Complete this outfit with burgundy leather desert boots. 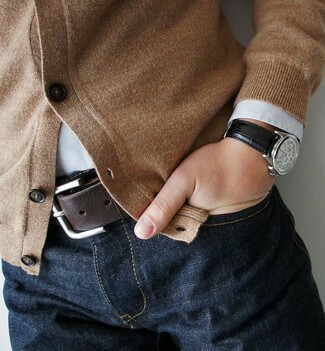 If you're on a mission for a casual yet dapper look, pair a tan cardigan with navy jeans. Both pieces are totally comfortable and will look great together. 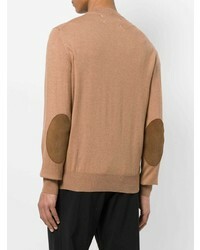 Marry a Maison Margiela v neck cardigan with charcoal wool dress pants for incredibly stylish attire. 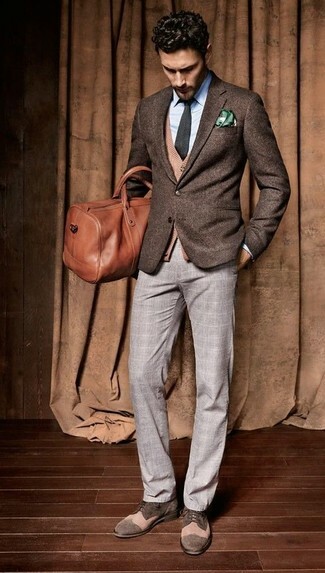 Add a sportier vibe to your getup with brown suede desert boots. 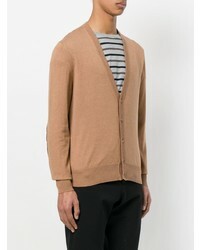 If you're hunting for a casual yet dapper getup, team a Maison Margiela v neck cardigan with grey chinos. Both items are totally comfortable and will look great together. If you're on a mission for a casual yet sharp look, opt for a Maison Margiela v neck cardigan from farfetch.com and aquamarine chinos. Both items are totally comfortable and will look great paired together. Up the cool of your outfit by completing it with brown leather tassel loafers. 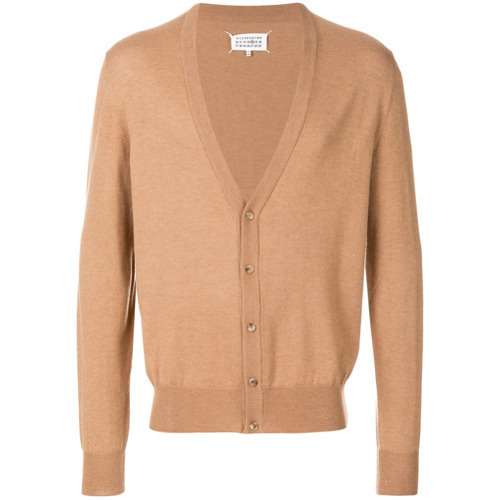 If you don't like spending too much time on your looks, opt for a Maison Margiela v neck cardigan from farfetch.com and navy jeans. Bump up the cool of your look by rounding it off with dark brown suede derby shoes.